a soft murmuring or rustling sound; whisper. As I wander down to the reedbed at Red Rocks a soft rustling, a whipser comes from the gently swaying Phragmities. It is the only sound. I am the only one hearing it as there is noone else here. I'm on my own. Not many people will be able to claim to have had West Kirby beach and Red Rocks to themselves on a double bank holiday weekend. It is just turning 6 o'clock in the morning and the sun is hanging low and pinky orange. The beach still bears the scars of yesterdays day trips. It is like a litter bomb has gone off. Gulls and Magpies pick through the wreckage of the barbeques and take-a-ways discarded by lazy beach-goers. It is not these birds that I am after. The breeze causing the susurrus is south easterly and that means migration. Wheatears are still passing through, more of them later. Whimbrel are on the outer edge of the saltmarsh. They take off with their 7 whistles call piercing the susurrus, a 21 whistle salute and off they fly towards Hilbre. A Grasshopper Warbler is reeling on the golf course, one of 3 I hear over the murmuring reeds. The sun is still low and casts an orangey glow over the dunes. 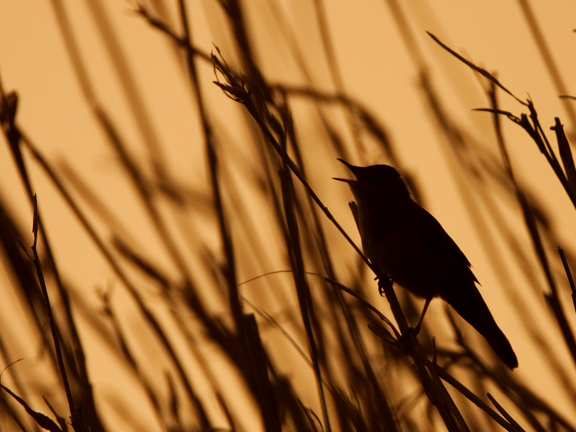 I locate the Gropper, he's displaying high on a dune, silhlouetted against the sunrise. I hang around until the sun gets highter and the light improves, but he does not oblige me with a pose I can photograph well. 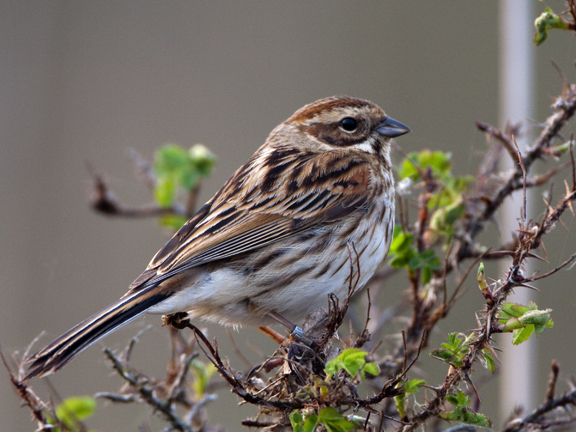 Several Reed Bunting fly over, a female drops in right in front of me. She poses, I take her picture, she leaves. That's more like it. 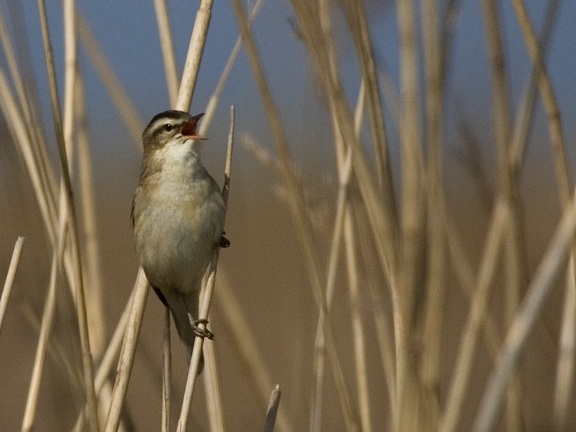 The Sedge Warblers are buzzing from the cover of the reeds, plenty of them. Every now and then a couple clash above the reeds, chasing each other before dropping into the swishing beige reeds. I follow the song of one and eventually I'm rewarded as he hops up and up a stem and into the clear long enough for me to capture his image for this blog. I was hoping to get these and the Groppers recorded on my camera's memory card this morning but I also managed a bonus warbler as I wandered home for breakfast. Another addition to the growing ranks of my Breakfast Club. There is a small patch of phrag away from the main bed, it doesn't look up to much, but something is calling from the edge of it. Not quite the same as the Sedge Warblers song, but close. 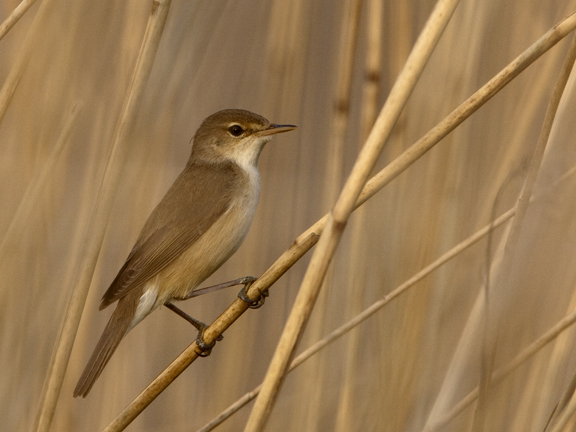 Must be a Reed Warbler. Soon I catch a glimpse, it is a Reed so I get the camera up to my eye and try and find it amongst the tangle of stems. It's tricky, but I get him in the end! That has to be that I think after the bird hops out of sight. Time is running out on this session, I have to be at work soon. I head home for a bowl of museli (not a great breakkie, but I'm tyring to cut out the greasy stuff!) a quick change and a cycle ride along Chiffchaff Alley. There is still one more encounter to come as I wander back. 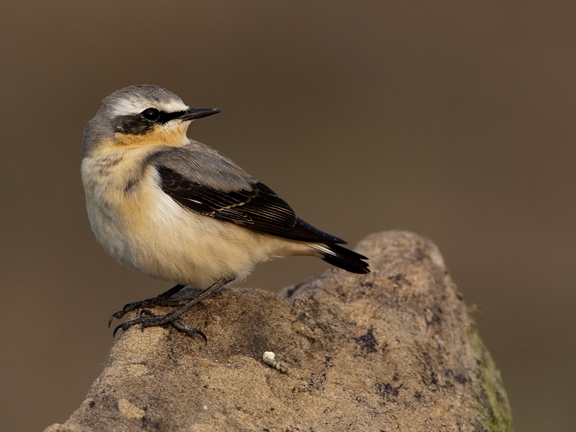 A few Wheatears are drifting about and I notice one perched on a rock not far away. They are usually pretty flighty but this one seems quite content that I am walking up to it. It's on the path, I'm not stalking it but as it is posing (like the fem Reed Bunting earlier) I take a few frames. I could happily stay here all day with the birds, but work beckons and the first joggers and dog walkers are starting to emerge. Soon the beach will sag under the weight of visitors and the birds will melt away. I reckon I've had the best of the days birding and it's not even 8am! This cracking morning even makes the museli taste better.